Using Facebook to promote your website and drive traffic to the products and services that you’re an affiliate for is one of the best ways to quickly generate income. However, many people promote their websites on Facebook in the wrong ways, which usually leads to them being labeled as a spammer. There are quite a few different ways you can drive traffic to your site from Facebook and make money from your affiliate offers, without developing the reputation. So before you start getting blocked from your favorite pages, or tossed out of your favorite groups onto the curve, follow these suggestions, implement the strategies I’m giving you, and then use Facebook to drive massive amounts of traffic to your affiliate links. Ok, there’s a bit of a caveat to this one. Facebook has recently implemented changes to their algorithm that makes it harder for people that have liked a page to actually see the content that the page is producing. With them limiting the organic reach of pages on their platform, many people have resorted to “boosting” posts and paying for advertising to increase their reach. This is one way to do it, however there are cheaper ways you can make sure people that have liked your page will see the content you’re producing. The best way to make sure people are seeing the posts that you’re publishing is to get them to interact with your posts, either by commenting, liking, or sharing them. As your engagement rate goes up, your organic reach will increase. However, if you’re not able to increase your organic reach, you can boost your posts to make sure they’re getting out to your audience, while also targeting new audiences that are similar to the organic audience you’ve already built. 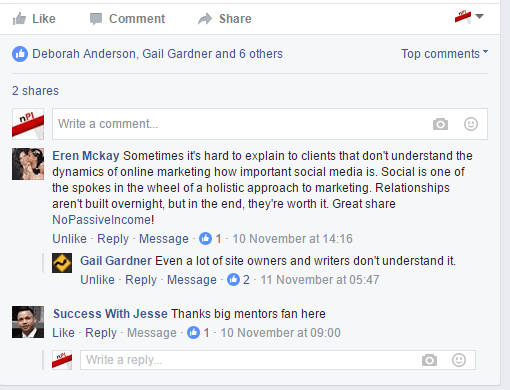 Facebook Groups are the new Pages, and allow you to reach more of your audience without being forced to pay for it. While this may not always be the case, for the time being Groups are doing great, and are fairly easy to grow. Most groups are growing organically, however there are some marketers that are paying for boosted posts that contain links to their groups, and are seeing a massive influx of new users as a result. When you publish a new piece of content to your group, you can almost guarantee that at least 40% of the people in your group will see it, where less than 10% of the people that have liked your page will see it. You can’t just publish content, though, and hope to get the results that you’re looking for. You may want to read the following post, which includes a list of the most popular Facebook groups I joined: Unleash the Power of Social Media Marketing – Useful Resources Mentioned Here. If you want to maintain the reach, whether on your Page or in your Group, you’re going to need to make sure that you’re publishing content that people actually want to see, click on, and read. Then you can parlay your content into your affiliate links and connect the two together so you can eventually make sales. People love original, awe inspiring, emotion inducing content, and are more than happy to click it and read it, but if they feel like you’re being a marketer, or trying to pitch your products and services, they’re going to turn off and make it harder for you to make the sale. To give you an example of what I’m talking about, let’s assume you’re running a Page or Group based around motorcycle racing enthusiasts. You can create a piece of content that teaches them how to change out the spark plugs and wires on their motorcycle. Since you know that the people on your Page or Group are going to be interested in learning how to do it, you can create an in-depth tutorial for them. Then, as you work through the tutorial, you can create links to products that they may use while they’re changing out their spark plugs and wires, and a portion of the people reading the tutorial will click the links to take your recommendations. As long as you’re providing value first, and not making the tutorial specifically about promoting your affiliate links, you’ll have a much easier time promoting the content across other Pages and Groups, too. You also won’t be labeled as a spammer. People understand that marketers are trying to make money, and if you bake the affiliate links into the content inconspicuously, you don’t have to worry about getting tossed out of other Groups, or blocked on Pages that you’re trying to share on. If you’re providing valuable content that people want to read, here are 31 more ways to increase the chances that you’ll generate revenue from the people you’ve worked so hard to bring onto your website. One of the best ways to grow your own Group or Page, or to work out deals with Page and Group owners is to partner with them, and then cut them in on the profits that you’re generating. Many owners and administrators are open to the idea of you providing valuable content to their audience, especially if you’re going to share the profits with them. You can’t just reach out to the owners and suggest this arrangement, though. You’re going to need to build a relationship with them, and show that you are truly interested in providing valuable content, instead of out to simply make a quick buck off their audience and then move onto the next. 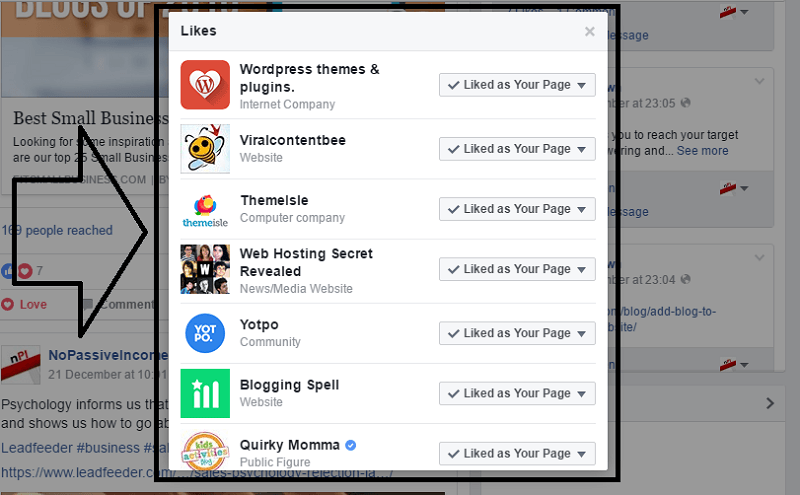 This strategy works best if you already have a Page or Group with a built-in audience. You can cross-promote each other’s groups, and then not have to share in the profits with the owners of the Pages or Groups you’re trying to promote your content in. When you’re promoting content in other people’s groups, you’re going to end up getting people that like, comment, and share the posts you’re publishing. When this happens, you want to make sure that you’re taking the time to engage with them, at least by responding to their comments. You can go one step further and reach out to the people that shared the post, asking them what it was that they specifically enjoyed about it. By engaging and replying to comments, you’re going to leave a mark on the people you interact with, so they’ll be more inclined to comment, like, and share your content when you publish new posts in the future. Then, after you’ve done this a few times, your reach in that specific group will go up substantially, because Facebook’s algorithms will see that people are enjoying what you’re posting, and want to help you reach even more people, without forcing you to pay for it. Engaging with the users that are interacting with your posts also helps the Page and Group owners out, because you’re increasing their reach by increasing the engagement with the posts on their Group or Page. As their engagement goes up, their organic reach will go up, which will make them more inclined to let you stick around and continue promoting other content that you’ve created. This is one of the best ways to build a long-term relationship with the owners that you’re working with. If you want to take a long-term approach to promoting your content on Facebook, instead of sending the users to a page or blog post that contains your affiliate links, you should try using Facebook to send those same visitors to a landing page that collects their email. This strategy is slightly harder to implement than sharing an actionable, valuable blog post, because Group and Page owners know that you’re only doing it to collect emails, but if you’re able to solve problems that people in their audience are having, you can still pull the strategy off. By pulling the visitors onto a landing page, and enticing them to subscribe to your email list, you’ll have many more opportunities to follow up with them later, without having to pay Facebook for the clicks, or worry about not reaching all of your audience. Safeguarding your subscribers from changes in Facebook’s algorithms is a smart way to build your business, because even though Groups are a great way to get in front of people who are interested in what you’re offering, it’s in Facebook’s best interests to eventually limit the reach of Groups so that marketers are forced to pay for it, instead. If you’re the type of marketer that prefers to taking growing your list into your own hands, one of the best ways to do it is by paying Facebook to get your offer (or your landing page) in front of people who you know are interested in it. Before you start spending money on Facebook Ads, you’re going to want to make sure you have a proper sales funnel in place, along with an autoresponder series that will help you start generating revenue as soon as Facebook starts delivering traffic. Having a sales funnel and an autoresponder will help offset the costs of the Facebook Ads, or at least help reduce the actual expense of the ad campaigns, so that you can spend more money on traffic and grow your list without hitting a ceiling on your budget too quickly. Paying for ads guarantees your reach, and as long as you’re targeting specific interests and researching your market properly to ensure that you’re getting the ads in front of the right people, you can grow your list far faster with an ad than you can by promoting the content in Groups and Pages. I gave you an example of creating valuable tutorials so that you are actually helping your audience, instead of simply taking from the Groups and Pages that you’re posting to. Creating valuable content is actually easier than promoting junk. If you’re not familiar with the type of “junk” that I’m talking about, go spend some time in a few popular groups that aren’t great at keeping the spam out. You’ll see constant new posts from people who never interact with other people in the group, and only post pages to the content on their blog. The content that is usually a straight-up sales pitch for some shady products or services. These people’s lives are usually short-lived in the Groups, because once the administrators realize what’s going on, they’ll ban the users. Instead of finding yourself getting banned, don’t publish junk content that doesn’t help anyone but you (by way of an affiliate link click) or constantly spam groups that have a no-spam and no-promotion policy in place. Even if you’re not paying for advertising to grow your Group or Page, you may want to in the future. This is especially true if Facebook implements new algorithm changes that limit the organic reach of Pages even further, or reduce the effectiveness of Groups. A retargeting pixel, if you’re unfamiliar, allows you to build a custom audience inside of Facebook that you can advertise to later, for much cheaper than you would pay for advertising to the same people if they had never visited your website before. When someone lands on your website, the pixel will fire off, and the person’s computer will have a cookie placed on it. Then, when you go to create a new advertising campaign on Facebook, you can use the custom audience that has been built from people who have already visited your site, and spend substantially less for each click that you generate. As long as you’re focused on providing value first, and building long-term relationships with the owners of the Pages and Groups that you’re trying to promote your content through, while making sure that you’re doing what you can to collect an email address instead of letting the visitor bounce off your site, you can use Facebook to push a massive influx of traffic into your site. Affiliate marketing with social media is one of the fastest and most enjoyable ways to get started making money online. Nowadays, there is a growing number of ways through which internet marketers make money from affiliate programs. Facebook ads are really genuine for thrive our email lists. Eventually, thanks for sharing your worthy ideology with us. Hey Erik, Thank you for your informative article and also for sharing the affiliate link as i was really confused that how to promote my affiliate programs while following the terms and conditions of advertiser your article turned up fruitful . Really look forward to have more worthy content like this ahead. This is amazing idea to increase sales from social networks. Facebook become largest human community, and this is amazing tip to harvest affiliate in groups and pages. By the I like your tip to join popular pages. Glad to know these tips. Hey Erik can you tell me how can I subscribe your site? because doesn’t find any thing like to enter email. 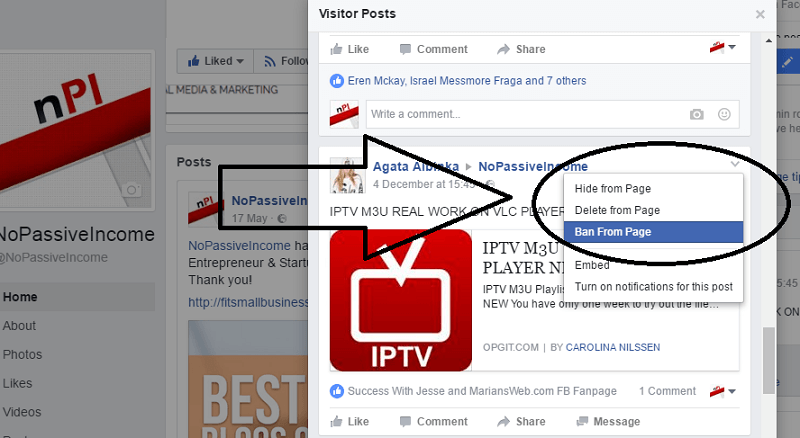 Some helpful tips and insight to promote on Facebook and make money. Facebook is a great platform and if you don’t go spammy, we can promote and get traffic easily. Don’t spam, that’s the most important suggestion. One of biggest mistakes of my starting days is that I neglected the power of Facebook. But now is the time to boost it up. Facebook groups are the source to get more exposure for sure. I have joined a few groups and getting some positive results. Handling an FB page is quite a hectic thing. But if you do, you can promote any product you want. FB ads are the best solutions for everything. Facebook groups have great potentialities. However, from my experience, I find FB groups with a high number of members really dispersive. Users are posting lots of spam and people are not really paying attention to quality posts. I guess a small group of engaged members is much better. Thanks for sharing your views here, Ravi. The point you made out about the Facebook Group having the potential of reaching 40% of the Fans has cleared my doubt which was longing for years. I have always wondered which one is better. Other than that your guide on promoting affiliate on Facebook is promising and realistic. But I have doubt on Facebook Ads, as most of the time, it was failure for me. Do you have any suggestions? Affiliate marketing is one of the fastest growing market in internet marketing. Affiliate marketing with social media is most needed for all business to make a good earning in online. Facebook affiliate marketing is an enhancing concept in this busy world that everyone needed to know about this. And this will give us an unusual increase in sales through social media platforms. Though comparing to twitter, facebook is not that much trustworthy but still if we harvest in affiliate marketing it will be good. Thanks for this informative post. Thanks for your comment, Sathish. Affiliate marketing is the best process for me to make money from online. No doubt Facebook is one of the best source to get attention of huge audience. But to find proper buyers from huge audience, above steps are crucial and essential. Thanks for sharing this informative guide. I think that should always be the number one rule. First, give value and then make profit (eventually). Indeed facebook is wonderful platform for promoting affiliate offers. Pages and groups are great places to share our affiliate stuff. I have seen people earning thousands of dollars on black friday and cyber-monday promoting on facebook alone. Facebook can be a powerful marketing weapon, but you must pay attention to their guidelines. Awesome tips to promote affiliate offers on facebook. Now i am going to execute this to make more money online. Happy to have you helped. Thank you for useful advise, I really need try to do this. Now I promote travel insurance on my travel website, as a Globelink Affiliate. And have small success in it. Probably, facebook promotion will help me to increase my income. Good techniques to promote offers on facebook, I loved it. Good techniques to promote offers. Thanks for wonderful post.